Since Europe, there are things I crave. They aren’t the larger things either, but truly the simple pleasures that made me feel content; the moments that made me slow down when my head, full of over-analysis and bad memories rewinding and replaying like a bad loop, otherwise would have just kept on pestering me—drinking a chocolate-encrusted cappuccino in a Parisian café, marveling at the beautiful flaking of a real croissant, Prosecco cocktails as the vibrant Tuscan sun set over the Florence countryside. I miss walking the quiet, empty streets of Florence early in the morning before the vendors even opened up shop. I never went anywhere without coffee far behind. Florence got under my skin like a first love. I’m hooked. I wake up every morning hoping I’m back there; waking up to the river breeze kissing my face and not the blaring sounds of my alarm. I also miss the resonant bells that chimed every hour; they were comforting. Since I’ve been back, I’ve been restless. I’ve seen so much more of life now but yet I still cling to the past. It’s an anchor and it’s been slowly sinking for a while. I haven’t been able yet to pull out the anchor and set sail for something new. There are times I find myself wanting to share the exciting moments of my life with someone from my past just to realize I can’t. It would just be weird now. So instead I think about how that conversation would go and revel in it. It’s probably better in my head anyway. So why do I still crave those moments? Because that was my life for so long, I suppose. I was comfortable. No, it was more than comfort. I was happy. I haven’t truly been happy since then…until I set foot in Florence. Of course I was happy to see England and Paris–two of the main places on my bucket list–but I was still handling the pain and dissociative state I was in from the months before. 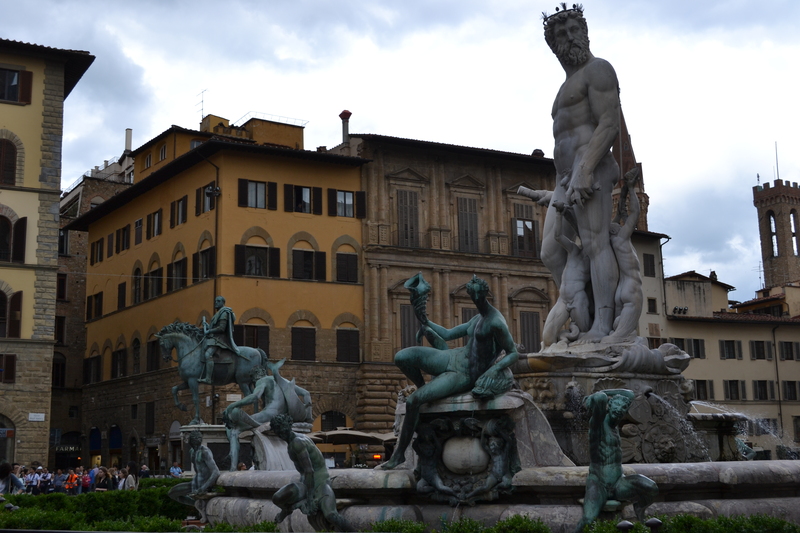 It wasn’t until I got to Florence that I was inspired by the art, the music, the architecture. I started thinking about writing my book again. I finally couldn’t wait to pick up a paintbrush after months of leaving unfinished art around my apartment, scattered by the wayside. I spent hours contemplating how to incorporate the Renaissance art, with its subtle religious symbolism, into a comic book that had become only a distant memory. I now had all the time in the world to do it as my time wasn’t wrapped up in anyone, and yet the minute I landed back in the states I was restless. I’m left searching for more. I need to wake up to the bells of Florence. I need to see one more blindingly red sunset, I need to hear the crooning of the flamenco guitar in the Piazza Della Signora. I need the smell of leather and brick ovens around me. I crave Florence like a lovesick teenager. But I guess it’s best to put my pining into a place rather than a person. At least I can always go back. I’ve been incorporating Florence into everything I can—prosecco mimosas for afternoon brunches, caprese lunches (I’ve found that basil and mozzarella can pretty much pair with anything), limencello after-dinner drinks, even the touristy “I heart Florence” shirts hang in my closet. I also don’t have a shortage of Italian wines lining my kitchen windows. I’ve really done my part for their economy over the last few months. But until I can pull myself completely from this deep hole of a funk, I will bake. With a slew of birthdays this month, I’ve found that I’m quite the gelato maker. I also have no problem sharing with friends so that I don’t dig into the tubs all day long. In fact, one friend told me he shared my amaretto gelato with a friend who promptly pulled out his checkbook and declared that he would fund my gelato business, should I ever consider one. This is quite the compliment if I ever heard one. However, since I’ve truly been contemplating a gelato business (I even have a name and logo already), I’m afraid to give out my recipe (I’m sorry for the tease); however, you’ll just have to console yourself with a decadent s’mores tart. Even the marshmallows are from scratch (and better yet, boozy). That’s right—amaretto marshmallows (because apparently I have a love thing with amaretto). While these delicious beauties don’t need to be enjoyed near a bonfire, it does help. It certainly doesn’t get more summer than this. Now to figure out how to combine Florence with my love of baking. Who knows, maybe I’ll open a shop there someday. God, do I miss the bells. ** Make the marshmallows first as it’s best to leave them overnight. 1. Pour the Disaronno in the stand mixer bowl and then sprinkle the gelatin over it. If the gelatin doesn’t fully absorb, mix it around with a small spatula. 2. In a small pan, combine sugar, corn syrup, salt and water on medium heat. Stir constantly until it gets really thick and hot (about 240F; use a candy thermometer if you have one). 3. Turn the stand mixer on low and slowly add the heated sugar into the mixing bowl. Once incorporated, add the vanilla extract and put the mixer on high. Whip the mixture for about 15 minutes or until it’s thick and cooled. 4. While the mixture is thickening, use baking spray (or Crisco) on a small baking pan and then coat the entire pan with powdered sugar. 5. Once the marshmallow mixture is ready, pour it into the pan and let it sit at room temperature for at least four hours (I left it overnight). 6. Once the marshmallows are ready, dust your counter top or workspace with powdered sugar and turn the pan upside down to get the marshmallows out. You want to make sure you keep the marshmallows on the powdered surface otherwise they will stick to everything (NO joke!). 7. Use a sharp knife or pizza cutter to cut the marshmallows and then dust them with more powdered sugar. Store them in a ziplock bag with a little more powdered sugar sprinkled in there for safety. **This time I found graham cracker crumbs in the grocery store, so I didn’t have to bang them against a counter or deal with plastic baggies exploding. Not as therapeutic, but it definitely shaved some minutes off my kitchen time. 1. Combine all three ingredients and knead it a bit. Then fold them into your muffin pans (if you have tart tins, this is preferable; however, I did not, so I went with my tried-and-true muffin tins). Make sure to form the crust into little cups by kneading the crust up around the sides of the pan, too. 1. Put heavy whipping cream on medium heat and bring to a boil (I know what they say about a watched pot, but in this case, watch it). 2. Once boiled, pour the boiled cream over the bowl of dark chocolate chips and stir until combined. 3. Then whisk the eggs, vanilla extract, bourbon and salt into the bowl and stir. 4. Pour the filling into the graham cracker crusts and bake for about 10-12 minutes (check after 10 minutes to make sure it’s done. The chocolate filling should be baked around the edges but a bit jiggly in the center. Don’t worry, the center will set as it cools). 1. Boil heavy whipping cream again in a medium saucepan. 2. Once boiled, remove from heat and stir in the chocolate chips until combined (exactly as you did for the chocolate filling). 3. Then stir in the butter, corn syrup and warm water. 4. Once the filling has cooled enough, poor the glaze over each filled tart. Use a butter knife to evenly coat the tart. Then let the tarts cool for an hour at room temperature. One thing to note is that marshmallows from scratch seem to have a different consistency from the ones you buy in the grocery store. It probably has something to do with the fact that the bagged kinds are chock full of preservatives; but that’s just my guess. Either way, they are much stickier and a little harder to roast over an open flame. Since I’m lucky to have a gas stove, I’m able to roast the marshmallows rather easily; however, they will start to melt almost immediately, so don’t do this for very long. Once they are a bit browned from the flame, quickly pop them on top of the finished tarts. And just like that, you’re ready to start up a bonfire, invite a couple friends over, twist open a bottle of chilled limoncello (or is that just me?) and devour these decadent morsels. I also had some filling and glaze left over, which I promptly put into little crème brulee dishes as an individual-sized snack for the next day. Chocolate, wine and friends–could there be anything better? Now, if only we were in Florence.